Also safely shreds staples and plastic credit cards. 3.8-gallon bin with easy lift-off head. Cut Size: 7/64" x 25/64"
Cut Size (inches): 5/32" x 2-1/16"
Cut Size: 5/32" x 1 1/2"
Waste Bin Capacity: 4 gal. Welcome to MyBinding video. So you’re in the market for personal shredder. As you shop around here at MyBinding, you’ll see there’s lots to choose from. So here’s a few ideas to keep in mind as you purchase. Could you use something small that fits right on top of a trashcan or something much larger that has greater capacity? How much room do you have for the unit itself? Shred capacity is probably the most important factor to consider. Will you be shredding the occasional junk mail or will you have a stack of work a couple of times a day to shred through? Because even on small personal shredders, the shred capacity range can go from just a couple of sheet all the way up to 10 or even 20 sheets. Next you’ll want to consider non paper items, such as credit cards or name badges or CDs and DVDs. Different shredders are built with different purposes in mind. If you have digital or data material that you need to destroy, you’ll want to keep that in mind. Make sure it can shred CDs. Whether the shredders can be used at home or the office, child and personnel safety is important. After all, we are dealing with gears, sharp teeth and a motor ebb on destruction. Some have very little safety at all and some are rather sophisticated. In paper shredding, jams are inevitable. Look for a machine that can help clear jams with reverse buttons or auto-reverse features. And again you can see here why safety is an important factor to consider. Another factor to consider is bin capacity. How much shredding can this bin hold? Is it going to match your workload or work environment? Bin capacity will determine the amount of recycling trips you’ll be making and you can get an idea of just how easy it will be to empty, reload and start again. Last but not least is security. 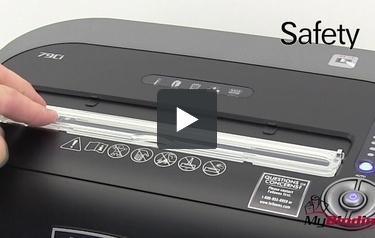 There are actually six different security levels in paper shredders. We have a great video that details each level so you’ll know what you need. Here at MyBinding.com we pride ourselves in our customer service. If you have any questions at all, give us a call. We could help you find the right personal shredder for you. For more demos, reviews and how-to’s, check out MyBinding.com.